BrainBOK PMP® practice exams and CAPM® practice exams are developed and reviewed by PMI®-certified project managers to ensure the highest level of quality. Each exam consists of realistic, unique and challenging question designed to simulate the format and difficulty level of the real exams. Detailed and crisp answer explanations backed by authoritative reference sources instill confidence in our students and make our exams highly reliable and trustworthy. All full-length PMP® and CAPM® practice exams meet the respective specifications published by Project Management Institute (PMI®). Our exams are developed and reviewed by PMP®-certified professionals and have been top-rated by our customers. Three (3) full-length exams, one (1) dedicated formula-based exam and two (2) exams based on direct questions from the PMBOK® Guide. Dedicated formula-based exams for both PMP® and CAPM® not only prepare you for the exam but also help you on the job. Formula exams come with a companion guide (PDF) that provides quick reference for all the formulas that you need to know for the exam. Detailed answer explanation and reference links are included for each question to help reinforce concepts. Master your weaknesses by using the Mastery Mode (MM), which tracks exam performance and identifies questions that require more practice. Mark questions for review and revisit them later using the Review Grid. Jump to any question straight from the grid. Unanswered Mode shows all the unanswered questions while the exam is in progress. It simulates a similar feature on the real exam. Save an in-progress exam session and resume anytime later from same or different device. Exam is saved automatically every 2 minutes so that your effort is not wasted if the session gets terminated abruptly. The score report shows the overall result, and proficiency level by Process Groups and PMBOK® Guide chapters to help identify weak areas. Exam History shows the list of all the exams taken in the past, along with their results and scores. Clicking on an exam opens it for review. Email exam report or the entire exam history with one click. We are constantly listening to feedback from our students and improving our content. Every comment is reviewed by our team of experts. We offer 6 exams with 1000+ questions for PMP® and 6 exams with 800+ questions for CAPM®. The following tables illustrate the details. 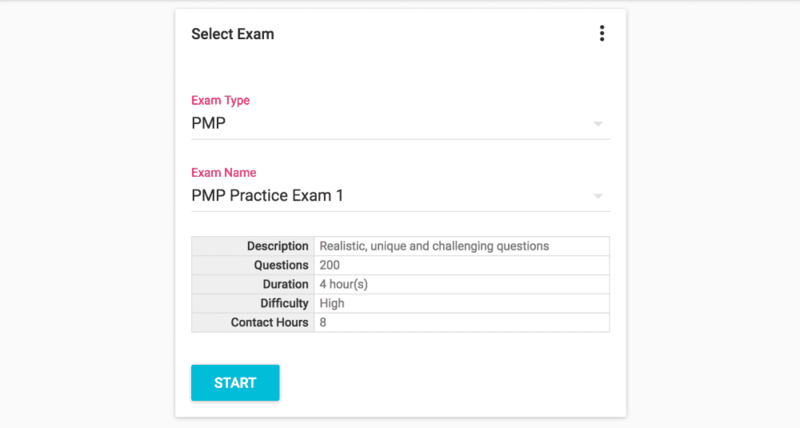 Our practice exams contain PMP-like sample questions, not actual PMP exam questions. Providing real PMP exam questions would be illegal. All exam providers including us provide sample questions. 1. Help our potential customers evaluate the features of our exam simulator. 2. Get a good foundation in the basic project management concepts described in the PMBOK® Guide. We have another exam - Mastering PMBOK Exam 2 - which is an extension of the exam 1, but has 200 questions. Our full-length PMP® and CAPM® Practice Exams are much more difficult than the Mastering PMBOK Exam 1 and 2. In fact they are more difficult than the real exams (based on the feedback we have received from our students). Most of our students fail the full-length practice exams on their first attempt. 1. First, take the Mastering PMBOK Exam 1 and 2 to assess your knowledge of the PMBOK® Guide. 2. Next, take the PMP® / CAPM® Practice Exam 1 for a full assessment. 3. Next, take the PMP® / CAPM® Formula Challenge Exam, which, true to its name, is going to challenge you! 4. Next, take the PMP® / CAPM® Practice Exam 2. 5. Finally, take the PMP® / CAPM® Practice Exam 3 to test your exam readiness. Pro Tip 1: After each exam, thoroughly review the gaps in your knowledge and cover those gaps with the help of our other tools (Mastery Mode Exam, ITTO Explorer, Quiz, Flashcards) and your favorite PMP® / CAPM® study guide. As Project Management Institute (PMI®) does not reveal the PMP® passing score (same applies for CAPM® exam), we use 61% as the passing score on all of our exams. Though we try to match the difficulty level of the real exams, our students tell us that our exams are slightly more difficult than the real ones. Based on the data that we've collected from our students in their last week before the real exam, those who scored 50-55% on their first attempt on our practice exams passed the real exam. We continue to adjust our exams from time to time as we get more insights from the data that we gather. Mastery Mode is a special exam that helps you master your weaknesses. Refer to Mastery Mode in PMP / CAPM Exam Simulator for details. Yes, absolutely. Refer to Show Exam History and Review Exam in PMP / CAPM Exam Simulator for details. Yes, you can retake our exams any number of times within your subscription period. If you spot a problem - inaccurate information, typos, grammatical mistakes, layout problems, etc. - with any question, use the 'Send Feedback' button available on the exam page. You do not need to type the content of the question. The system automatically tracks that information. All you need to do is to type the problem and hit the Send button. The total pool has 115 questions. Our exam simulator selects 50 questions at random from the pool for each exam. If you take the exam multiple times, you'll see a slightly different set of questions in each attempt.